In the Cloud: New web parts for SharePoint Online! We know that some customers are considering moving to SharePoint Online and have been asked if our SharePoint web parts are compatible. To run on SharePoint Online a web part has run in the Sandbox Model. Quite frankly this is hard and there are many restrictions – which is why there are so few vendors selling cloud compatible web parts. For our own products some features would have to be removed (e.g. web part connections in Planner and PivotPoint) some would have to be radically re-designed (such as TeamTime) and with some (FilterPoint and Highlighter) it’s just not possible to run them in the sandbox model at all. The strategy we’re adopting is to create SharePoint Online / Cloud specific versions of our web parts to avoid having to ‘dumb down’ our normal on-premises web parts. 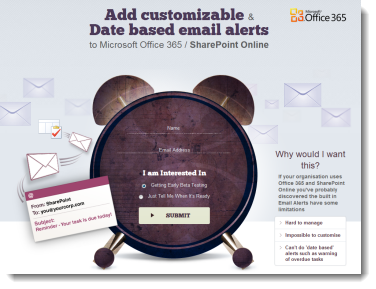 First up is a cloud specific version of Reminder that allows you to add customizable and date based email alerts to SharePoint Online / Office 365. 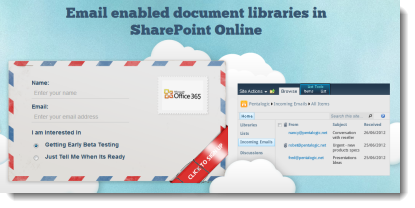 We’re also developing a service that will allow you to use Email enabled document libraries in SharePoint Online – something that’s provided out of the box in normal on-premises SharePoint installations and many people are surprised to learn is just not available in SharePoint Online. Don’t worry, our feet are still firmly on the ground! We’re not going to forget about those of you who don’t plan to move to SharePoint Online and those of you who appreciate the extra flexibility of traditional on-premises installations that give more power to be able to adapt and enhance the platform your your needs. As always – get in touch if you have any questions or feedback or would like to let us know which product you would like us to adapt.